Meguiar's G110v2 Car Polisher - Why I Absolutely Love It! Meguiar’s G110v2 Car Polisher – Why I Absolutely Love It! Home/Tools/Meguiar’s G110v2 Car Polisher – Why I Absolutely Love It! I have owned my car for the last 20 years and I have never thought of detailing my car with a polisher. I have been doing the detailing work with my own hands. The results were always satisfying. Even my friends were doing their detailing work with their hands. Here I would like to add that although I owned and detailed cars of different colors like white and silver, this is the first time I am trying to detail a black colored car. When I bought my black car, I didn’t think anything was different with black color and I would continue to detail it like other cars I detailed earlier. But when I started to work on it, I realized that things are different and difficult with my new black colored car. Only after buying my car, I came to realize that detailing a black car is the most difficult detailing work of all. Now that I already have the car and I had to find out a way to keep my car as shiny as possible. When I first tried my traditional method of detailing the car with my hands, its coat of paint had a number of ugly spots and marks which I could not remove in any way. The more I tried to remove them, the worse they became. So I decided to take professional advice from people who are experienced in the field of car detailing. At the same time, I didn’t want to employ somebody else to do the detailing work. The people whom I approached for help advised me to use a dual action polisher like the Porter Cable. Though I was skeptical about the effectiveness of a polisher, I decided to try one as I was advised. 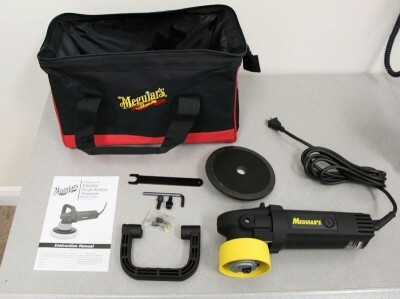 While I searched on the internet for a polisher, I happened to notice the name Meguiar’s G110v2 Dual Action polisher. This is a familiar name to me because I have been using Meguiar’s products for hand detailing of my cars previously. Since its products always delivered what they claim, I trusted the brand and decided to buy the G110v2 car polished from Meguiar instead of a Porter Cable polisher. It doesn’t mean that other polishers are bad; I felt more comfortable with a Meguiar product. I also went through the user reviews and found that the reviews spoke positive of the G110v2 polisher. The right procedure to detail a black car, I understood, is to clay the car first and then apply car polish. It is followed by applying a sealant to protect the paint and polish. The result will be excellent. You may think that I am bragging when I say that people take pains now to have a look at my beautiful black colored car. I just wanted to keep my car neat and clean and I never wanted to create trouble for the people. Thanks to Meguiar’s G110v2 Professional Dual Action polisher, my car has become the center of attraction and I will never do a hand detailing again. If you love your car and you want to do your own polishing and detailing, get the Meguiar’s G110v2 polisher from Amazon.com and have it delivered to your door step. ==> Click here to buy Meguiar’s G110v2 from Amazon.com now!